We're not always on board with Guy Fieri's recommendations, but this one is an exception. 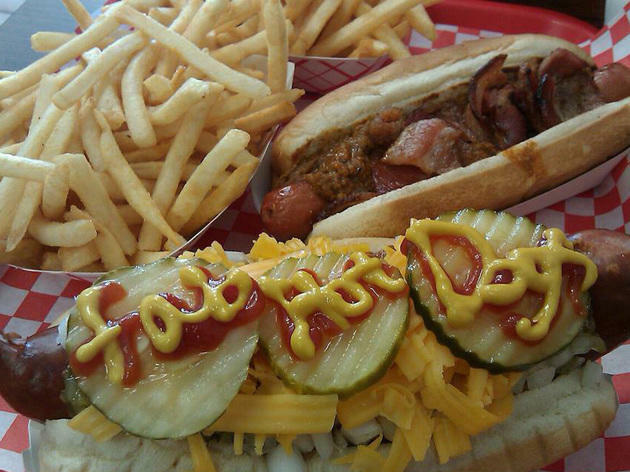 Fab Hot Dogs made an appearance on Diner, Drive-ins and Dives in 2010, and soon after the Reseda location exploded with a newfound appreciation for the hot dog stand. A sizeable menu of house specialty dogs lets visitors indulge in a curated construction of hot dog, bun and toppings, though you can always build your own if you know exactly what you want. We're partial to the Chicago Dog, an all-beef masterpiece topped with neon relish onions, sport peppers, tomato, celery salt and a pickle spear on a poppy seed bun. Quite some time ago, I saw these New Jersey hot dogs on the show Parts Unknown, hosted by Chef/Writer/TV host Anthony Bourdain. He called them The Ripper. My understanding is that Fab Hot Dogs were also featured in the TV show hosted by Food Network personality Guy Fieri, Diners, Drive-Ins and Dives. Somehow on my last trip to New Jersey, I missed trying them. But recently I found them at Fab Hot Dogs in Reseda. I happened to drive by it on my way home from a meeting in the area. 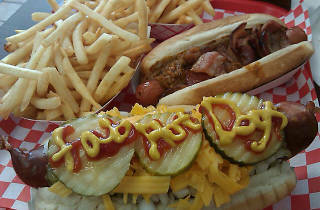 Fab Hot Dogs has a large, extensive menu with all manner of dogs and sides. Because it was a 109 degree day, I just wanted a snack before heading home in rush hour. The Ripper is a slang term for a hot dog with natural casing that is fried in the deep fryer, causing the casing to rip. The outside is crunchy and inside tender and juicy. There are some smatterings of this dog throughout LA, but at this location, they actually import the hot dogs from New Jersey. It's the real deal. And it's extremely tasty and satisfying. While there are several options already put together for you, I picked the "build your own" option and created my own Chicago hot dog inspired creation. I went for diced onions, fresh garlic, pickles and sports peppers. The whole thing got a light squeeze of ketchup and mustard. It went together perfectly with very clean flavors. The bun was also noteworthy, which usually is not the case with hot dog buns, in my opinion. The service was extremely efficient and friendly too. I got greeted by the whole kitchen upon walking in and the gentleman taking my order offered some good suggestions on my "build your own" adventure.